With the release of the European Medical Device Regulation in May of 2017, the three-year transition countdown implement updated regulatory requirements began for device manufacturing corporations, notified bodies and EU regulators alike. As the EU MDR will supersede the current directives, and introduces many new requirements, it is pivotal for the industry to secure a strong understanding of mandates, as well as a full perspective of the impact on all operations, starting with re-certification of legacy products, to set a comprehensive and aggressive transition. While many regulatory affairs professionals have conducted gap assessments and implemented remediation plans to ensure timely compliance, many questions and challenges remain for industry and related stakeholders including Notified Body certification, Brexit, and product prioritization under the EU MDR. Following the success of the 2018 edition, which primarily focused on areas of project management to introduce MDR implementation into a company’s structure, the 3rd Annual US EU MDR Implementation conference will focus on the advancements companies have made in the transition process and provide benchmarking progress for comparable organizations. 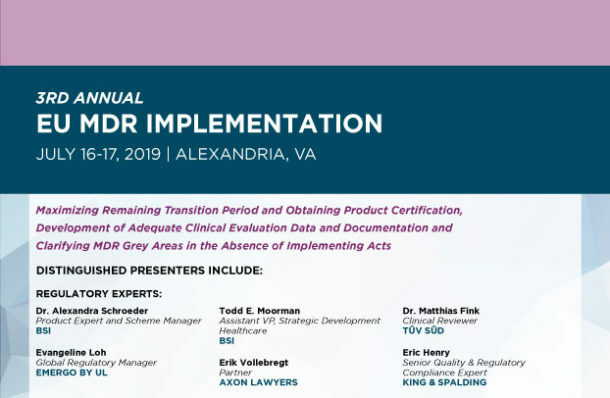 Taking the topics one step further, the conference will focus on the time remaining in the transition period and what companies can expect from notified bodies and regulators as the implementation deadline draws to a close, as well as clarifying areas of uncertainty such as implementing acts and defining sufficient clinical evidence. Through real-life case studies presented by industry thought leaders that have launched in-house transition, as well as panel and small group discussions in addition to hands-on workshops, the event will provide participants with a high volume of key deliverables all while supplying a dynamic networking environment enabling direct interaction with peers and notified body leaders.